by bus or service taxi from the Ahmed Helmi terminal, near Ramses Station. 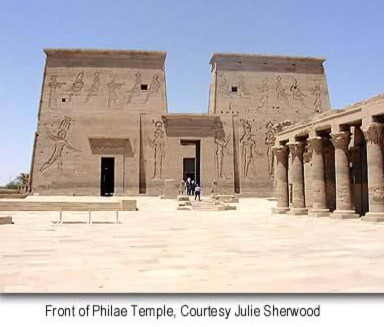 Philae Temple was dismantled and reassembled (on Agilika Island about 550 meters from its original home on Philae Island) in the wake of the High Dam. The temple, dedicated to the goddess Isis, is in a beautiful setting which has been landscaped to match its original site. It's various shrines and sanctuaries, which include The Vestibule of Nectanebos I which is used as the entrance to the island, the Temple of the Emperor Hadrian, a Temple of Hathor, Trajan's Kiosk (Pharaohs Bed), a birth house and two pylons celebrate all the deities involved in the Isis and Osiris myth. The Victorian world fell in love with the romance of the Temple. But at night you can also visit the Sound and Light Show, a magical experience as floodlit buildings are silhouetted against the volcanic rocks and water surrounding them. So today, Philae is more fun then every before. Although antiquities on the island date between the 26th Dynasty and the Roman Period, most of the work is from that of the Roman. This was a time of immense popularity of the Goddess Isis, and this was her island, where pilgrims would come from all over the Mediterranean. 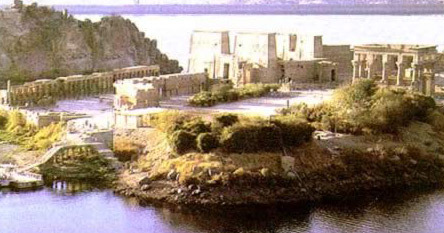 Construction on the island took place over an 800 year span, and it was one of the last strongholds of Ancient Egyptian Religion which continued to flourish here into the 6th Century. When the Temples where finally closed by Justinian in A.D 550, it ended 4,000 years of worship of the pagan gods. 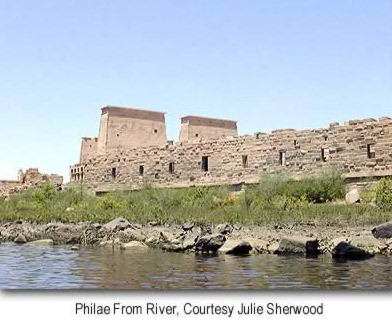 The Philae Temple complex, prior to its removal and restoration, set alongside Biga Island. To the ancient Egyptians, Biga was the sacred mound, the first ground created from Nun out of Chaos. This was the legendary burial place of Osiris. The earth was considered to be part of his body so that only priests and temple servants were permitted to live there.